an ephemeral protest that will die out soon enough. I have even been told that workers at a Burger King close to Zucotti Park were lamenting their low wages all the while facing signs which demanded an end to wage slavery. As frustrating as this may sound to the left, who are justifiably excited over a revival of radical politics, many workers cannot see the movement’s relevancy to their own lives, yet still feel the pangs of the crisis perhaps more painfully than most. This apparent disconnect, however, is not due to ignorance of the message of OWS or its distortion by the media—as if a precondition of revolutionary consciousness requires taking stock of every shred of information available. Neither can it be explained as a phenomenon related to an urban environment as such. Rather, this gap rests on the mistaken assumption by the Occupiers that their struggle is the common struggle for all of the working class, as exemplified in such opaque terminology as “the 99 percent.” This conflation lays the groundwork for a variety of other problems which reinforce a certain type of radical politics that on one hand “demands nothing/everything,” while at the same time locates crisis in finance and banking. Thus discussions of political pluralism or “diversity of tactics,” which seeks to be as inclusive as possible to all participants, the Occupiers’ support of and commiseration with unions as institutional victims of the crisis as well as attempts to block foreclosures, all provide an ambiguous yet complex picture of a movement grappling with the issue of class and its representation in 21st century America. One continuing feature of OWS has been the notion of “no demands” and the political heterogeneity of the occupations and movement in general. The occupations officially started on September 17th and were aimed at the “financial heart” of capitalism, namely Wall Street, as it was perceived to be the primary location of where capital reproduces itself and by default, where the core of the crisis emanated. Tents pitched, the Occupiers ended up in Zuccotti Park where they were able to obtain food and other items for living without cost based on donations from supporters who had access to such means. This first stage grew immensely not just across the country, but globally within weeks. The very idea of occupying a public space allowed the movement to become open to all who felt the pangs of the crisis to come and bring their own concerns. This open space was able to absorb all ideas which seemed to be politically marginalized by the media and by politics proper, that is, those of the state. This plurality convinces many that due to the far-ranging political beliefs, all could be accommodated under a broad message no matter what their position or situation was. Fringe right-wing libertarians could stand next to bourgeois environmentalists while both participated in a session of “the People’s Mic” from a socialist lecturing on Marx’s theory of primitive accumulation. They may bitterly disagree with one another on an individual basis, but that is not what OWS is about; it is not personal politics but a united politics based on general outrage due to the crisis. As September turned into October, much of the old guard of the labor movement expressed a mixture of glee and caution to the Occupiers, who they saw as potentially manipulative. However, with the weakened position of unions both due to decades of neoliberal victories and also of the immanent bureaucratic tendencies of union themselves, they were soon joined by thousands of students in a march from Foley Square near City Hall to symbolically join the Occupiers in Zuccotti Park. On October 5th, approximately 20,000 rank and file workers, union leaders, community organizers and students marched in unison. Reactions from onlookers, particularly the working class, were largely positive, with truckers honking their horns, construction workers clapping and restaurant and bar workers throwing fists in the air. The atmosphere seemed to be one of genuine unity from all who felt the pangs of the crisis. One banner which had been unfurled at a fountain at the center of Foley Square announced the “American Autumn.” The unions thus seized upon precisely this opportunity in order to reinvigorate public sympathy and associate their struggle as those of the workers, especially those of the public sector. Rather than taking actions which could indefinitely paralyze the city from working and therefore really put the question of labor’s involvement in OWS in a more pointed and concrete manner, the unions opted to marshal their own on November 17th in order to make sure there would be no confrontation with the NYPD. No general strike, no nothing. The Occupiers, caught up in the left populist rhetoric of understanding the unions as defenders of the working class, have offered no substantial critique of the role of unions, in spite of many opportunities which could have been taken but were missed. Certain socialist elements within OWS have often voiced their complaint about the faint-hearted role of the unions in radicalizing the movement, but were either continually ignored or shouted down for the sake of mass appeal and plurality. Other strategies which have been somewhat less frequent yet perhaps appeal in a more direct manner to the working class such as walking the picket line and preventing the foreclosure of homes. In Brooklyn, hundreds of Occupiers prevented several families from eviction and the police, whose normally abusive behavior towards OWS seemed to out of character as no mass arrests or acts of violence were committed. These events are ongoing, yet have thus far not materialized into an expansion of the Occupation. Since the official start of the crisis in 2008, the working class in New Jersey has also engaged in its fair share of strikes and protests. Public sector workers in New Jersey have been on the defensive since the right-wing Republican governor Chris Christie stepped into office in 2010, first attacking the NJEA, the teachers’ union. Small protests had broken out, but nothing to the extent of what happened in Madison, Wisconsin last winter of 2011. The aggressive campaign against state workers has been justified as to correct New Jersey’s spiraling debt which had reached a peak under the former liberal Democratic governor Jon Corzine. 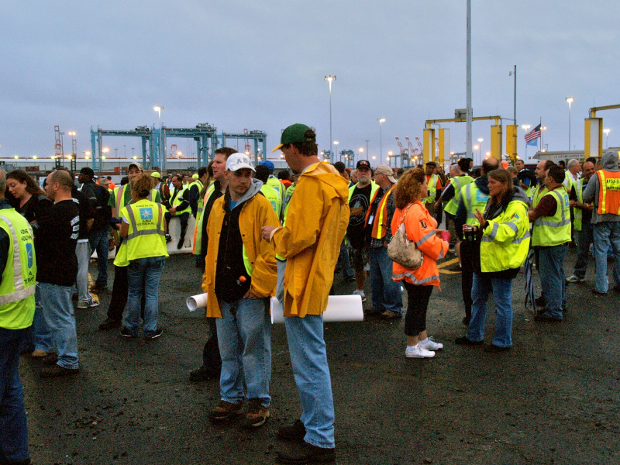 In September of 2010, longshoremen launched a wildcat strike on the docks of Port Elizabeth in solidarity with their comrades in Camden and in Philadelphia who were being squeezed by Del Monte Fruit Company. Del Monte was attempting to save on shipping costs by moving its operations to a non-unionized (ILA) dock in Camden. The strike spread to Newark, Staten Island and Brooklyn. Hopes were high that it would become national, but ended within a few days that same month. Actions have occurred with or without the unions in New Jersey and elsewhere in America, and rather than opposing financiers, striking workers have come up directly against their own bosses who are in the business of providing “productive” services. Such occurrences, due to their short-lived nature, receive some coverage before being subsumed by sports news and interest pieces on gardening, etc. Few media commentators would ridicule such actions, but in so many empathetic gestures, stress the danger if it were to spread further. The general opinion of OWS among workers I’ve spoken with has been a combination of dismissal, pride and ridicule—often by the same worker. Dismissal, because they don’t see how the occupation of public spaces like parks and city-owned land could possibly halt the crisis in its tracks. One worker reacted with surprise when he heard that there was outrage on the part of the Occupiers after the OWS Library had been torn down—“It’s not even a real structure, so what do you expect?” At face value, this may seem callous, reminiscent of Victor Hugo’s indignant poet who scolds the illiterate arsonist for burning the Tuileries Library in Paris. Speaking with this worker and others, who have likewise called the initiative of setting up tents in Manhattan as food for the media, have also praised it—“finally, somebody in this country is standing up for something”—and even recognizing that “protests [like OWS] take time.” These contradictory perspectives point to a tendency that in fact wants to see the occupation go beyond their current state to something more militant, and see this as their opportunity to do so. 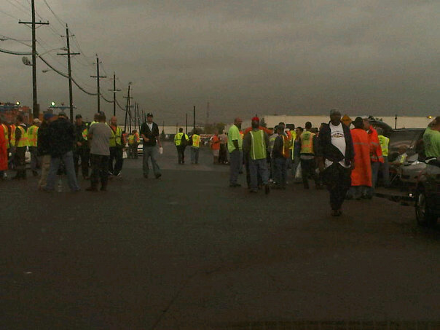 For these workers, however, their critiques also suggest that it is not their fight. In the midst of union revitalization, their fight is to combat the reformist tendencies, the poison pill contracts of the TWU, ILU and SEIU if any progress is to be made in improving their own lives. Almost two hours south of Zuccotti Park, less than a hundred or so men, women and children have set up tents in the woods outside of Lakewood, New Jersey. They are unemployed chefs, construction workers and retired pensioners—all of whom are looking for jobs. They subsist off of church charity and the site is built like a small town, complete with road signs and visible pathways. Their involuntary displacement in the woods is not symbolic. More and more, the working class finds itself outside in tents, or in other cases, cars. Not just in New Jersey, but also in Florida more of these tent communes have cropped up over the past year. Yet their demands have not been voiced as an attack on greedy bankers and their ideology is one of self-blame. They have already proven months before September 17th that occupying public and private space is feasible, that pulling together without the use of money is possible and that tying one’s belt tighter are all tendencies of survival in the midst of crisis. Capital can tolerate people leaving their apartments at will to sleep outside, to march, to demonstrate, to occasionally fight and provoke fights with the police. It cannot tolerate when these same people decide to organize their workplaces against the dictates of profit, or to cease working at an NGO and in any of the FIRE industries. It cannot tolerate when they refuse to leave their apartments because of an eviction notice. It cannot tolerate when these same actions multiply en masse and demand further participation that may lead to confrontation with the police and military, not out of ideological rage, but out of necessity. No longer will it then be a question of representation of the working class or preservation of its classic forms of organization, but the total abolition of waged labor by the working class themselves. I’ll share your report with my fellow Wobblies in Australia. The wage system and shorter work time need to be placed at the top of the movement’s agenda. The landlord class (even in their bankers guises) need to be struggled with over the question of homes for the workers/homes for the homeless/homes are not rental vehicles for the accumulation of Capital. Homes built for use and need. Well said I fully agree. I hope it will be of some use. I would like to address one concern I see in your argument, however. I think the point I was trying to get across is that any extension of demands which, while have been at best resistant to co-optation into the capitalist system, necessarily means the end of the Occupy movement. The union form is already enmeshed in capitalist social relations, and although that does not preclude that some sort of struggle take place within them, workers know that such limited struggles are limited by the unions themselves in addition to the capitalists. In light of capitalist decadence, I see really no worker struggle pushing forward any union (be it the IWW or something else), but rather having to go outside it as we’ve already seen in the events in Egypt and in Wisconsin. You can place as many demands on an ever-growing list, but no amount of calls for a general strike or the abolition of wage labor will make people confront the issue of production.